Kelsea Zeglin, our current front-runner, is the feature of the final segment of “Meet the Artist”. Her design is sleek – a coaster-style embodiment of the ubiquity of our mantra. Everywhere you look, Beer is Culture. Learn more about Kelsea and her design below. 1 )Tell us a little bit about your entry. What is the inspiration and story behind it? I stumbled upon this contest while reading Beer Advocate. Being a huge fan of craft beer and also working as a bartender, I was stoked to enter this contest. Being a recent Graphic Design graduate, I wanted to take this opportunity to show my skills of design. I chose to work with typography. Typography is one of the key elements to design, especially graphic design. For this, I wanted to incorporate typography into my design. 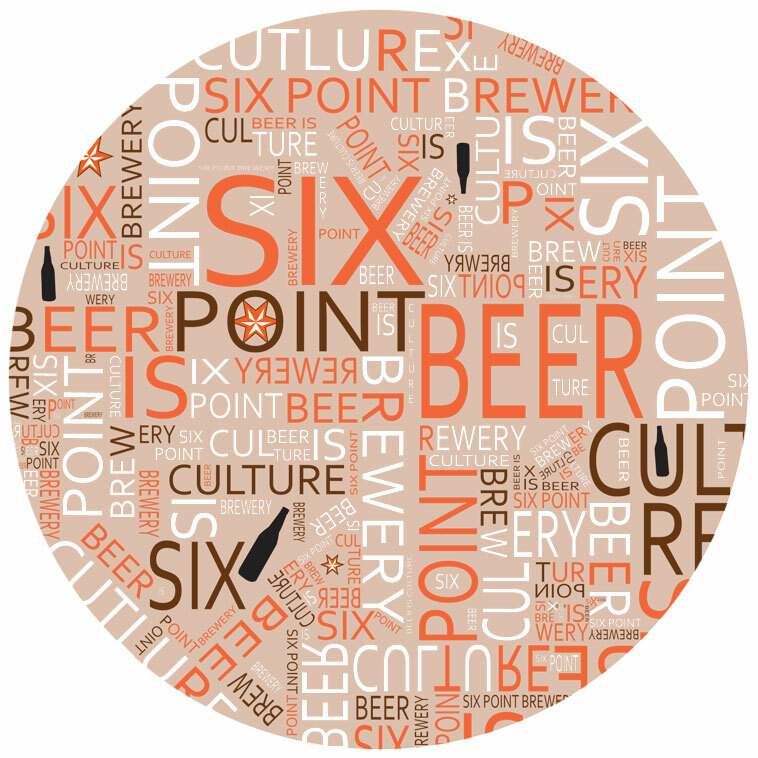 I used only the words BEER IS CULTURE and SIX POINT BREWERY, in which each word is placed in somewhat of a chaotic mess, but if you look closely each word relates towards the others. Have you ever seen those photographs that are entirely made up of just words? And when you look from it afar you see the whole image, but when you look closer they’re just words. And that is how I came up with the design decisions for my coaster. I do, actually, I have just recently graduated from Towson University with a BFA in Graphic Design. That being said, I have had a decent amount of artistic training, mostly with designing on the computer using various of programs such as CS5 (ILLUSTRATOR, INDESIGN, PHOTOSHOP, ETC) and I have dipped into hand drawing and painting as well. Most of my training has come from my education but there have been people that have taught me various things pertaining to art and, being a curious person, if I do not know how to do something (art related) I research and learn how to do it. So I would say it is a mixture of all kinds of things that have helped me develop some sort of an artistic ability. I feel that the invention of the personal computer and its ability to do a lot of what the human hand can create, is pretty remarkable. People may argue that computer generated art is half the work compared to artists that used their hands to create their work. In which part I can somewhat level with their argument. But, art is created through the human mind. The ability for one to create works of art starts within them, and how they choose to fulfill their ideas via conventional or computer should not matter. What we call “mediums” in the art world, I think of computers being another “medium” for carrying out one’s designs. There are ideas that work best through conventional art forms and there are ideas that work best through computer generated forms. You’re the artist, you decide your outcome not anyone else. It is funny you guys ask this because this was basically the number one question that many of my art professors always would ask us at the beginning of the term. Well I would say there are more THINGS that have influenced me, like the things I see everyday. I feel its not mostly the artist or artists that have influenced me, it is mostly the ideas I get from viewing their artwork. Also, people in my life have greatly influenced me. A couple of my art professors have defiantly stirred my creative mind and for that I appreciate and thank them. Beer can be found all around the world. Whether it is great or terrible tasting, people are still producing it. And this is not something new, people have been drinking and producing beer for thousands of years. Obviously this is telling us something…if beer has been around for so long, it defiantly can be considered a cultural phenomenon.